Does an Administrator of an Estate Have to Publish It in the Paper? Probate laws require certain facts be made public through publication. States vary as to what must be made public, where to publish and for how long, but every state has some type of publication requirements. Once made aware of probate through publication, beneficiaries and creditors have the opportunity to contest decisions of the personal representative or file claims against the estate. The first notices published in a probate proceeding in jurisdictions that require them are notices that probate of a particular estate is open and that a personal representative is appointed. In Maryland, for example, the notice is published by the Maryland Registry of Wills in a local newspaper. It provides the name of the personal representative so that anyone with a legal interest in the estate, such as a beneficiary, who has a problem with the appointment can come forward and file an objection. In a probate proceeding, an interested person is anyone entitled to participate in the proceeding, such as a beneficiary, family member unnamed in the will or creditor. In other words, anyone who might have a stake in the distribution of estate assets. Some jurisdictions require that a personal representative publish a notice listing the interested persons of the estate. Texas and Maryland, for example, require such notices to be published in a local newspaper. Some jurisdictions, such as Texas, additionally require the notice to be posted in the county courthouse where probate is taking place. Usually the notice must also be sent to each listed individual directly. A creditor of an estate is anyone the deceased still owed money to at the time of death, i.e. anyone entitled to collect an unpaid debt of the decedent from the proceeds of the estate. Creditors must always be given notice of the probate. Usually the notice must be published in a local newspaper. Creditors have a certain amount of time to file their claims against the estate after notice is published, usually six months. The deadline is significantly shorter, usually two months, for any creditor given notice directly. The amount of time a notice must run in a local newspaper varies by jurisdiction and type of notice being published. Many states, such as Maryland, require publication of any notice for three consecutive weeks in a newspaper generally circulated within the county where probate is being conducted. Why Is Advertising an Estate Important? The death of a beneficiary during the probate process can alter the distribution of the estate. Some wills include a provision stating that a beneficiary must survive the testator by a certain amount of time -- 30 days, for example -- but this type of contingency is not usually planned for. Whether such a provision is included in a will can make all the difference in how the assets of the estate are distributed. Whether or not you leave a will, your estate will most likely have to go through the probate process in your state after your death. Though state procedures vary, many offer several types of probate procedures depending on the size of your estate. For example, your estate may qualify for a simpler, quicker process if it has a small monetary value. The purpose of these probate procedures is to ensure your final financial obligations are paid and the remaining assets are distributed according to your wishes. Historically, probate described the process of proving that the requirements of creating a will were satisfied. In modern practice, however, the term is commonly used to describe the entire court process of administering a deceased person’s estate. 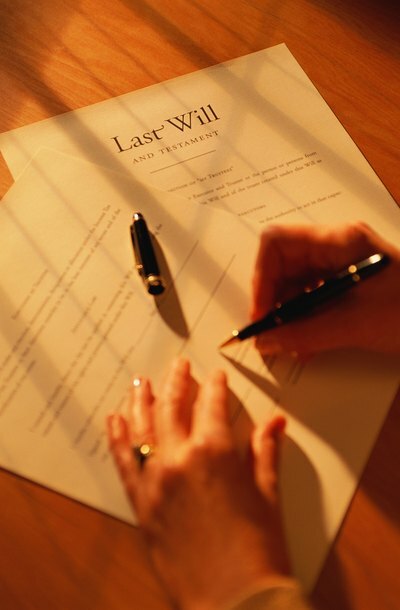 Probate in California is often required whether a person died with or without a will. When probating a will, a number of notices are required to “interested persons.” The notices give such individuals the opportunity to state any claims they may have to the decedent's property before the assets are ultimately distributed under the instructions of the will.